A chromosome is a long strand of DNA. At the end of a chromosome is a telomere, which acts like a bookend. 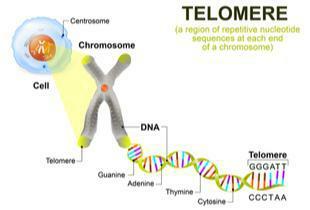 Telomeres keep chomosomes protected and prevent them from fusing into rings or binding with other DNA. Each time a cell divides, the DNA unwraps and the information in the DNA is copied. The process does not copy all of the DNA information – the telomeres are not copied. When the cell is finished dividing, the DNA comes back together. The telomeres lose a little bit of length each time this happens. Why Do They Get Shorter? When a cell divides and copies DNA, the strands of DNA get snipped to enable the copying process. The places that are snipped are the telomeres. Since the telomeres do not contain any important information, more important parts of the DNA are protected. The telomeres get shorter each time a cell divides, like a pencil eraser gets shorter each time it’s used. Can Telomeres Become Too Short? Yes. When the telomere becomes too short, essential parts of the DNA can be damaged in the replication process. 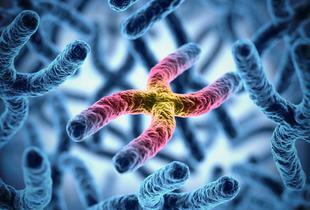 Scientists have noticed that cells stop replicating when telomeres are shorter. In humans, a cell replicates about 50 times before the telomeres become too short. People who have shorter-than-normal telomeres are more likely to develop the degenerative diseases of aging (such as cancer and heart disease), and are more likely to die sooner than those who have longer telomeres. While having longer telomeres is not an exact predictor of your longevity, it has been shown to be highly associated with longevity and health in many published studies. Telomerase is an enzyme that naturally lengthens telomeres and keeps them healthy, but in most of our cells this enzyme is not active. Each time the cell divides, the telomere gets shorter and shorter, until eventually the DNA in the cell “unravels” (like a shoe string gets frayed when the end-cap is gone) and the cell dies. While many healthy lifestyle choices have been shown to protect telomere length, and chronic stress shortens them, there is currently only one actual supplement (TA-65) that directly treats and lengthens telomeres. 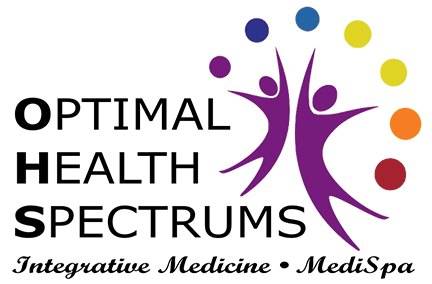 At Optimal Health Spectrums, we can test your telomere length and tell you whether or not you are average for your age, above average, or hopefully not – below average. We also know exactly what treatments have been found to improve telomere length, and which ones haven’t. Treating abnormally short telomeres is an important part of any comprehensive anti-aging protocol.